For some time before installing 18305 even, the VP11 was exhibiting signs of trouble. This has been a recurrent theme with this particular machine over the past 3 years. When I try to restart, the machine shuts down but doesn’t reboot. In fact, I have to pull the battery and disconnect AC power, then reconnect power to get it to boot at all. Each time this has happened, either a BIOS update or a fundamental driver change (meaning built-in Intel graphics or chipset drivers) has been needed to put the machine back into proper action. I’ve been incredibly busy with project work lately (some legal, some writing) so I hadn’t checked the Dell website recently. Sure enough, I found a raft of new drivers released since the middle of December when I visited earlier today. I tried the BIOS update first but was unable to apply it properly (from Windows, via standalone boot, or through Kyhi’s boot environment and Dell’s 64-bit BIOS installer). So next, I tried the chipset and graphics drivers. After another reboot, I was able to run the BIOS update through Windows. One more reboot, and now the PC once again restarts properly. It took a couple of hours to work through the process, but indeed I made some progress. “Great!” I figured. “I bet the new Insider Preview will install successfully now.” Wrong!!! Once again, it’s failing at roughly the same time during the Post-GUI install process. I’m going to consult with the BSOD/GSOD experts at TenForums.com (and Kari, too, of course) to see what we can glean from the logs. I’ve done what I can with the drivers on the system now, and I believe they’re all up-to-date. But there is still some lingering driver difficulty that I have to overcome. Following advice from Kari and others, I first go through the excellent TenForums.com Clean Boot Tutorial. 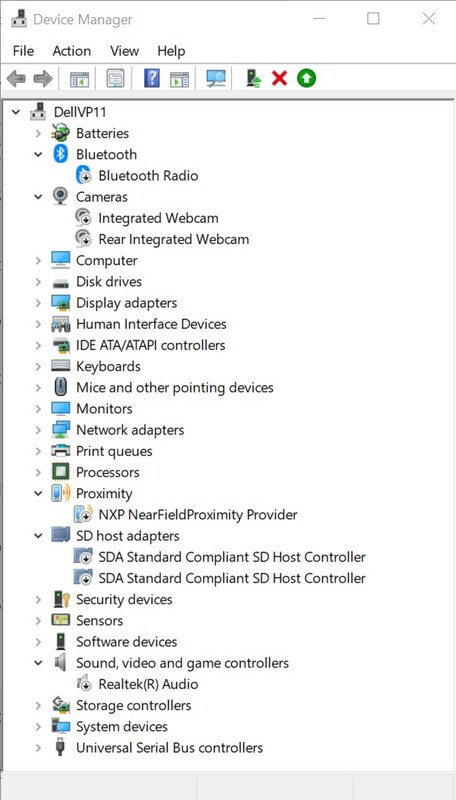 After that clean boot, I go into Device Manager and disable all non-essential devices (see screen cap). Then, I try the install/restart again. Fingers are crossed that clean boot plus eliminating all non-essential drivers will do the trick. The install makes it to the post-GUI phase more quickly, it seems. Post GUI kicks off (“Working on updates”). I’ll watch closely this time, as it gets past the 75% (or thereabouts second reboot). Seems like working on updates is taking longer (wonder if that’s a good sign, or bad one) . . . 86% GSOD, WDF_VIOLATION (that’s the Windows Driver Framework, and a clue that my problems remain unsolved). I’ll keep trying, and keep reporting here. Sigh. OK, then. After three failed attempts, it occurred to me that a clean install might be preferable. Working with Kari, I used UUP Dump to create an ISO for 18317, then used his TenForums Create USB Install Media for Windows 10 Installation & Upgrade tutorial to create a bootable USB drive from which to install that build. This worked like a charm, and now my system is on the latest build, working properly, and I’m over that long-standing hump. Alas, though, now I must rebuild my runtime environment. It’s always something. . .
See our latest post about this PC, in which Kari figures out a new method to get to 18323 (and probably beyond) using DISM to inject drivers into the Win10 installer file, and then uses DISM again to get around the otherwise typical clean install failure that machine started experiencing with 18323. It’s something of a “second coming” for the Venue Pro 11. Ed Tittel is a 30-plus-year computer industry veteran. He’s a Princeton and multiple University of Texas graduate who’s worked in IT since 1981 when he started his first programming job. Over the past three decades he’s also worked as a manager, technical evangelist, consultant, trainer, and an expert witness. See his professional bio for all the details.